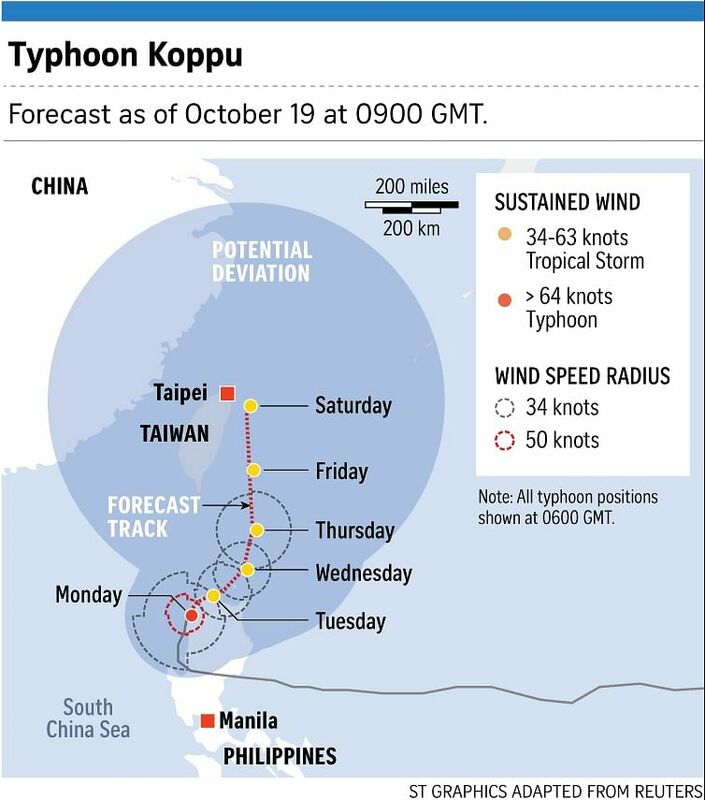 MANILA (AFP) - Powerful Typhoon Koppu ripped off roofs, tore down trees and unleashed landslides and floods, forcing thousands to flee as it pummelled the northern Philippines Sunday (Oct 18), officials said. At least eight people have been reported missing and rescue operations are underway in the rice-farming province of Nueva Ecija where rivers burst their banks and flooded several villages, regional authorities said. “People are asking for help because the floodwaters are rising. The rescuers cannot penetrate the area as of now,” Nigel Lontoc, the assistant civil defence chief for the region, told AFP. The social welfare department said more than 15,000 people had already been evacuated from Koppu’s path and officials said more are expected to flee as the storm, known as Lando in the Philippines, grinds its way northwards across the main island of Luzon before it is forecast to leave the country on Wednesday. “I must emphasise that this is just the start. People must remain alert while we try to pick up the pieces in areas already hit," Alexander Pama, head of the National Disaster Risk Reduction Council, told reporters in Manila late morning. Koppu made landfall before dawn on the coast of Casiguran, a remote fishing town of 31,000 people, remaining near-stationary for seven hours and whipping the area with gusts of up to 210kph. “Koppu tore off roofs of homes made of light materials. Rivers overflowed, and the roads to the area are blocked by downed power pylons and trees,” Lontoc told AFP. ABS-CBN network aired footage of a hospital building with its roof ripped off near Baler, the provincial capital that draws surfers from around the world. Lontoc also said the authorities cancelled a surfing competition in Baler for the weekend and ordered about 2,000 participants to remain indoors. By late morning the state weather service said the typhoon’s intensity had weakened slightly to gusts of 185kph while moving north-west over the Pantabangan Dam in the southern foothills of the Cordillera, the country’s largest mountain range. Despite the storm weakening, the authorities warned heavy rains could trigger flash floods and landslides in the region, home to more than 1.6 million people and known for its spectacular rice terraces carved on the slopes of towering mountains. “We are strongly recommending forced evacuations in the Cordillera administrative region especially villages that are landslide- and flood-prone,” Pama said. The National Disaster Risk Reduction Council in Manila reported landslides and floods elsewhere in northern Luzon, cutting off roads and bridges. Its director Alexander Pama told reporters ferry services across the island were suspended amid rough seas while commercial aviation was also disrupted with 30 flights cancelled, two of them on international routes. “I must emphasise that this is just the start. People must remain alert while we try to pick up the pieces in areas already hit,” Pama added. Residents of communities in the typhoon’s expected path were hunkering down under darkening skies, said Kate Marshall, part of an advance reconnaissance team of the International Committee of the Red Cross to the region. “There is a bit of debris around but nothing major as yet. The trees are beginning to sway a lot more,” Marshall told AFP from Solano town, about 100km inland. “We have seen people checking roofs and putting stuff away. There are not that many people on the road.... I would say people are prepared,” she said, adding local officials have prepared evacuation centres in case they are needed. Saludes, the weather forecaster, said that due to Koppu’s unusually slow pace, the mountainous areas and farmlands along river valleys in the area were expected to be lashed by intense rain for days. This could leave them exposed to floods and landslides, she said. The weather service has also warned of storm surges, massive typhoon-generated waves smashing along coastal areas, but Saludes said there had been no reports of these so far. Although the storm will not directly hit Manila, other regions within its 600-km swathe were likely to be affected by strong winds and rain. The deadliest and strongest on record, Super Typhoon Haiyan, destroyed entire towns in the central islands in November 2013, leaving more than 7,350 people dead or missing.